Fishing and fun in the rain! Last Friday, the All Access team and I traveled to Community Boating, Inc. for the first time. The sun was not shining that day, but we still had a great time. It was a rainy day, and we expected to work with the kids from CBI in the classroom for the majority of the day. However, the kids did not want a lecture on how to fish. Instead, they wanted to go out in the rain and fish for themselves! We thought it was a great and fun idea, despite the fact that it was pouring outside. Me holding my very first catch! We brought our fishing rods and even an eel trap outside to the docks. We cut bait and baited the rods and tossed them in the water. The kids seemed especially interested and grossed out by the dissection of the dead flounder, but they were happy that we were the ones touching them. 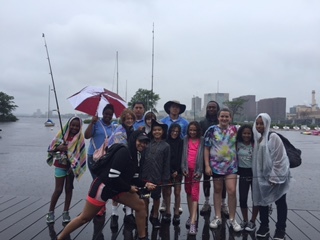 It seemed as though most of the kids had already fished before, but our senior harbor educator Maxwilliams was able to teach them safety tips that kids often seem to forget. One example being that you have to look left and right before casting your rod so you don't hook anyone! The rain kept pouring, but our day was coming to an end. None of us caught anything, but fishing in the rain brought a smile to everyone's face. We took the unused flounder bait and tossed it into the eel trap. We would return to the eel trap on Monday to see if we got lucky. Disgusted at first, the kids seemed to enjoy throwing flounder organs into the trap and the river-- a free meal for those fish that wouldn't bite. We came back on Monday and we were excited from the great time we had on Friday. The first thing we checked was the eel trap and to our surprise, we caught an eel! The kids were able to touch the slimy eel before we released it back into it's home. Towards the end of our session, I casted the fishing rod for about my third time in my life. Right away, I felt a tug on the rod. Could this be? Was I about to catch my first fish ever? And so it was, I was able to reel in my first fish and it turned out to be a bass. Once again, I had another great time at CBI and I can't wait to go back again!